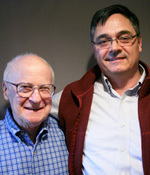 Click below to hear the audio of Frank Lilley’s conversation with his stepfather, David Plant, about approaching the end of his life. It was recorded as part of StoryCorps’ Legacy Initiative – an effort to collect interviews with people who have life-threatening conditions. Also, we encourage you to Share your own story about your father.